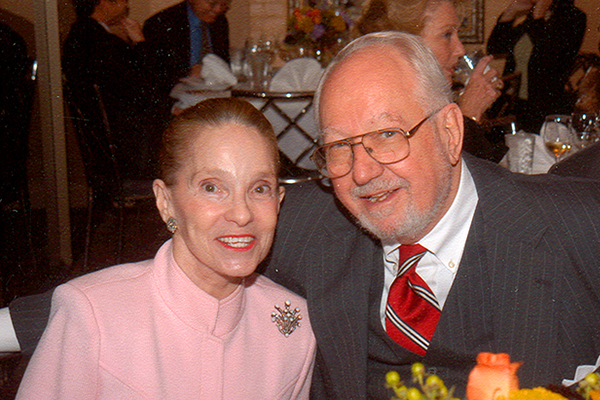 Darwin C. Fenner, with his wife, Mary Jane, at the 2004 Business School Council dinner. A graduate of Metairie Park Country Day, Fenner earned his bachelor’s degree in business from the Freeman School in 1954 and became a flight instructor and lieutenant in the U.S. Navy. He then spent 10 years with Merrill Lynch in New York and Atlanta. After earning his MBA from Tulane in 1969, he founded Fenner, Plauché and Williams Investment Management Co. in 1972. 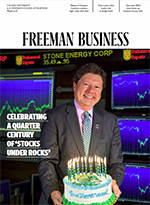 In 1999, Fenner donated stock to the Freeman School to establish a student investment fund in honor of his late father, Darwin S. Fenner. Under the guidance of Professor of Finance Sheri Tice, the Darwin S. Fenner Student Managed Fund became the centerpiece of an invitation-only honors seminar that emphasizes current academic research on portfolio management and value investing. Today, the fund has grown to more than $4.5 million and the fund’s three student-managed stock portfolios consistently outperform their benchmark indices without taking on greater risk. Fenner was honored as the Freeman School’s Outstanding Alumnus in 1976 and received the Tulane Association of Business Alumni (TABA) Achievement Award. He served as a member of the Business School Council, the Tulane President’s Council and the Tulane Medical Center Board of Governors. Fenner also served with civic, social, political, educational and charitable organizations in New Orleans including Boy Scouts, Red Cross, Rotary, United Way and Public Broadcasting. Fenner is survived by daughters Mary Jane Ingram and Joanne Sullivan; grandchildren Dorothy Bray and Darwin Windes; great grandchildren Josephine Windes, Roxana Windes and Lila Bray; his brother, James Fenner; and his sister, Flora French.